Thin and light, the Swift 7 features a premium chassis that liberates the display. The ultra-narrow 2.57mm bezels makes it virtually borderless in all four sides, giving this 14-inch laptop a 92 percent screen-to-body ratio. Furthermore, the width and depth are now reduced to 317.9mm and 191.5mm, respectively. This Swift notebook also has a thickness of 9.95mm (less than 1cm). This Acer notebook is feather-light, too, with its weight of 890 grams. It’s easy to stuff in your briefcase or small bag, and not feel encumbered carrying this portable computer at all. Despite that, the Swift 7 is durable with a body made with magnesium-lithium and magnesium-aluminum alloy. Acer also applied a micro-arc oxidation finish to create a elegant, ceramic-like surface. Plus, the layer of Corning Gorilla Glass 6 makes the screen extra durable. Moreover, this Acer device has chiclet keyboard with well-spaced keys, Corning Gorilla Glass touchpad, and a power button that doubles as a fingerprint scanner. The Swift 7’s 14-inch Full HD 1920 x 1080 touch display comes with IPS technology. This allows for smooth touch interactions and vibrant, crystal-clear images. The screen also features a 100 percent sRGB, 72 percent NTSC color gamut, and 300 nits of brightness. 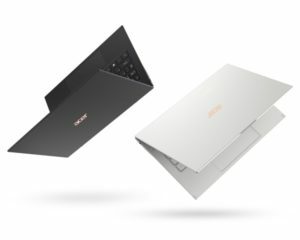 For connectivity, the Swift 7 comes equipped with two USB Type-C ports with Thunderbolt 3 support as well as USb 3.1 Gen 2. Meanwhile, the DisplayPort 1.2 provides fast data transfers at up to 10Gbps. This notebook also comes with Intel Wireless-AC delivering Wi-Fi 5, 2×2 MU-MIMO technology, and Bluetooth 5.0. The combo headphone and speaker jack ensures clear and crisp audio. In addition, the all-new Swift features a push-to-open camera. The lens has a 55-degree angle of view and features high-dynamic-range (HDR). Out of the box, the Acer Swift 7 already runs Windows 10 operating system. Under the hood, this sleek machine has the latest 8th-gen Intel Core i7-8500Y processor. This Acer computer also comes with up to 512GB fast PCIe SSD storage and up to 16GB of LPDDR3 RAM. For all day productivity, this laptop promises up to 10 hours of battery life in one full charge. 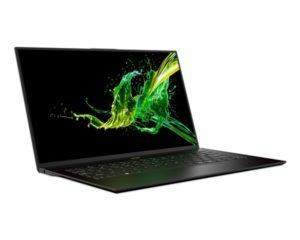 Acer is yet to announce the pricing and availability of the all-new Swift 7, which will be available in Starfield Black and Moonstone White variants. Stay tuned for more details coming soon via www.acer.com.